This week many Bitcoin enthusiasts saw the popular digital currency symbol on a giant-sized canvas of pixels on the subreddit r/place. Pixelated Bitcoin symbols were seen all weekend on Bitcoin subreddits. The April Fools’ Day social experiment created by Reddit had over 200,000 subscribers who were allowed to place one pixel on an empty canvas that was 1000 X 1000 pixels in size. The competition on r/place started on March 31 and ended 72 hours later, with many people adding a pixel to make smaller pictures. The catch was that users can change any pixel on the board, but have to wait five minutes between changing pixels again. Reddit users formed teams and used script bots to place funky pixelated drawings of their favorite ’80s cartoon characters or subreddit logos. Bitcoin proponents also participated in the fun by creating their own teams and calling on other Bitcoiners to help keep the Bitcoin logo represented on the canvas. Other pictures that were displayed were Mona Lisa, the Linux penguin, sports team logos, national flags, He-man, and much more. Cropped version of the r/place April Fools’ Day canvas. Can you spot the Bitcoin logo? In the beginning, the picture looked messy as everyone participating raced to get their logo on the canvas. As a bunch of Bitcoin fans joined the r/place competition, there were a few different symbols or the word “Bitcoin” displayed on the canvas. The Segregated Witness logo and the word “Unlimited” were also at one time displayed on the map of pixels. Throughout the weekend, across a few Bitcoin-related subreddits, many people saw various forms of the Bitcoin symbol created in pixels. An early snapshot of some logos that didn’t make the final cut. r/place was an amazing cultural snapshot of the internet in 2017 that is the perfect example of what the word ‘meme’ means in BOTH its definitions! The Bitcoin symbol itself did make the final cut among hundreds of other pixelated images as the competition came to an end on April 3. The tiny white and orange square is located on the bottom left side of the 1000 X 1000 pixel image. Some Bitcoiners on forums noted how well the cryptocurrency Monero did with their logo above the Bitcoin symbol and word. 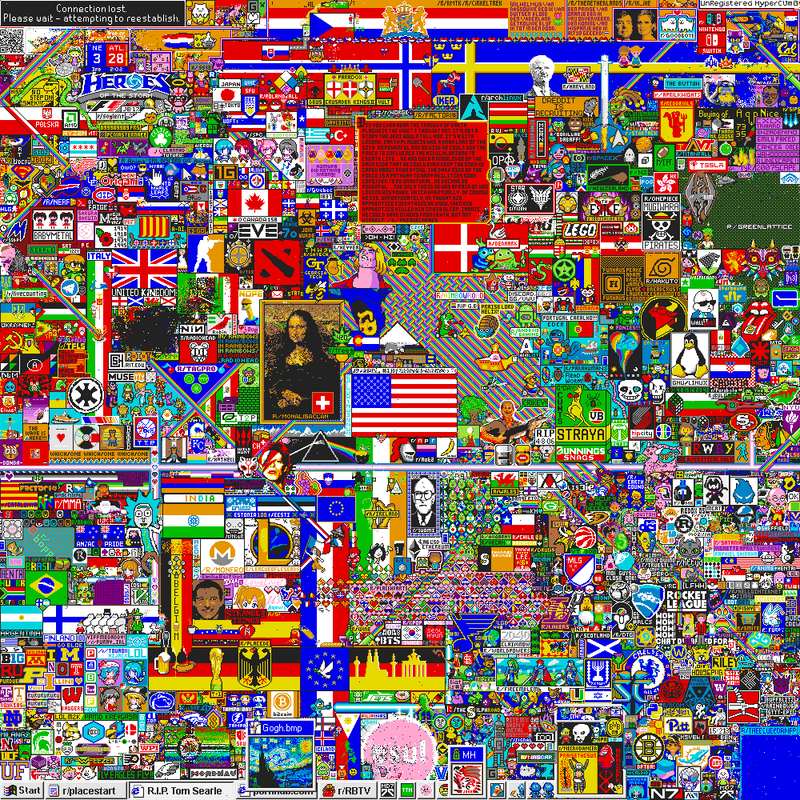 The final full-size version of the canvas at r/place can be viewed here, and a complete 72-hour time lapse video can be seen below. What did you think of the final version of the pixelated canvas located at r/place? Did you think Bitcoin enthusiasts did a good job? Let us know in the comments below. Images via Shutterstock, r/place, Imgur, and Reddit.